KS: Talese joined The Times as a sportswriter after he served a hitch in the Army; earlier, he’d had a job on the Times as a copyboy following his graduation from the University of Alabama. As I recall, he told me he intentionally targeted a job in the sports department because it would allow him to employ more stylistic freedom than other sections of the paper, which were very much locked into “Old Gray Lady” rules of writing. He said he admired what was going on in the pages of some of the other newspapers in the city at the time, in particular The New York Herald-Tribune. The sports pages of the Times would give him the same leeway writers at these other papers had. I read many articles he wrote for the Times’ sports section. They were experimental as hell for that paper. I remember one about the future light heavyweight champion, and future author, José Torres. The profile did not give Torres’ name until the last sentence! So Talese was doing this wonderful sort of creative nonfiction for the Times. To be sure, much of it was immature compared to the masterpieces he would later write. But it was interesting. 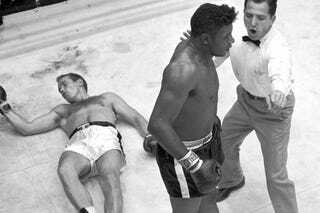 So, here you have Talese, interested in taking this whole new approach to sports writing and he runs into Floyd Patterson, a whole different sort of boxing champion. BB: It was as if they were made for each other. KS: Gay wrote more than four dozen bylined Times pieces about Patterson that I found. I’d never met Talase prior to starting research on the book, but he was nice enough to offer me some time for an interview after I approached him via a mutual acquaintance. BB: You went to his brownstone here in New York? KS: I arrived at Gay’s house on the Upper East Side on a day when he suddenly had crushing deadlines of his own. But he granted me time. I think he was impressed that I had dug up all those old Times articles. He was an absolute gentleman–of course attired in finely tailored clothes. He presented me with an inscribed copy of his newest book, which I totally did not expect. We talked and talked, not just about Patterson and D’Amato and company, but about Norman Mailer and James Baldwin and John Gregory Dunne and two of Gay’s great friends, David Halberstam and Ben Gazzara. ...BB: Patterson had an unusual sensitivity and honesty for a fighter of his caliber, didn’t he? KS: Let’s start with the instructions given by the referee before the opening bell. Nowadays, this is the time for the absurd exercise in posturing known as the stare-down. It wasn’t quite like it is now in Patterson’s day, but it was still expected that a fighter look the man he was going to battle in the eye. Patterson never did that. He stared at the other guy’s feet. He couldn’t look into the eyes of someone he was getting ready to hurt. If he did that, he wouldn’t be able to fight. He cradled Ingemar Johansson’s head after he knocked Ingo out. He helped an opponent recover his mouthpiece after he, Floyd, knocked it out. BB: He was also candid, especially with Talese. KS: Patterson was perhaps the most eloquent champion ever when it came to mining deep feelings and expressing them. He spoke honestly about fear, about cowardice — he described himself as a coward once. At the same time, he was reclusive and seemed to like to stay silent most of the time. He was not comfortable around people, an introvert, yet he did as much charitable work as any champion in history. He lived a conservative lifestyle in that he didn’t drink or do drugs or make the party scene very much, and he held conservative stances about other things, yet he was an early and outspoken liberal when it came to the civil rights movement. He lent his name and gave money to desegregation causes. He went to Alabama with Martin Luther King. He was often, to quote Kris Kristofferson, a walking contradiction.